What a fun and wonderful Christmas pin signed, “Original by Robert.” That mark was used by the Fashioncraft Jewelry Company founded in 1942. “Robert” refers to one of the founders, Robert Levy, a designer whose artistry was influenced by Mariam Haskell. The mark was used from l942 until l979. 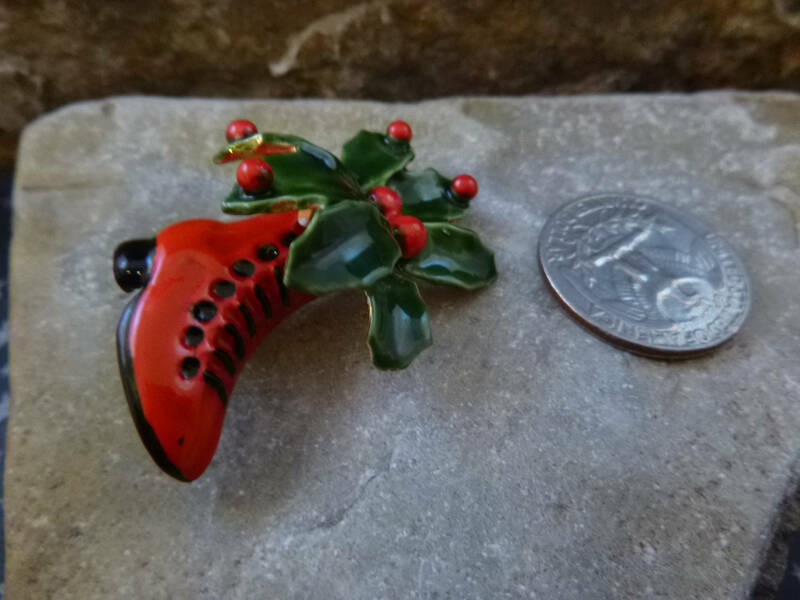 This terrifically unique Christmas pin is featured on page 131 of Mary Morrison’s Christmas Jewelry, 3rd edition, valued by her between $85-145 at the time of publication in 2009. 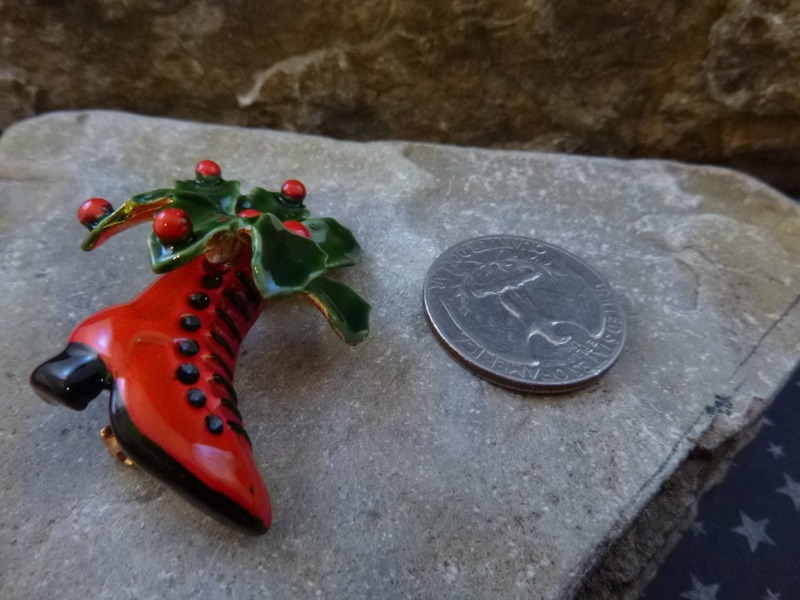 This bright red with black enamel Victorian boot pin is petite, measuring a little over l.5” in height and 1” wide. 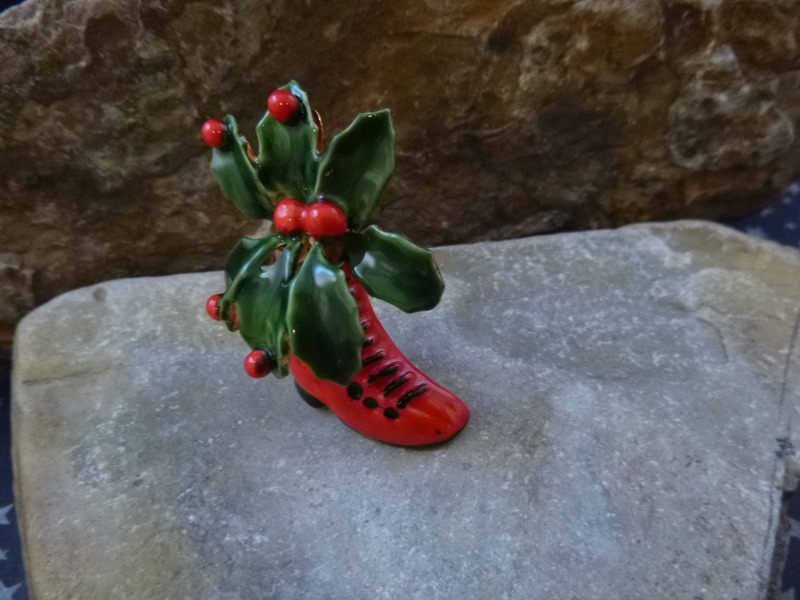 Packed with green holly and red berries, it’s a light-hearted and charmingly festive pin. 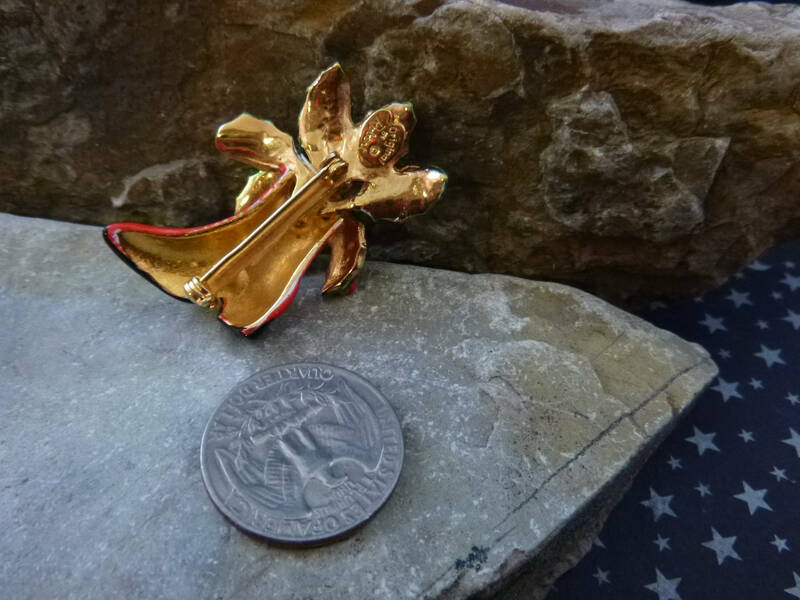 It’s also a collectible pin. 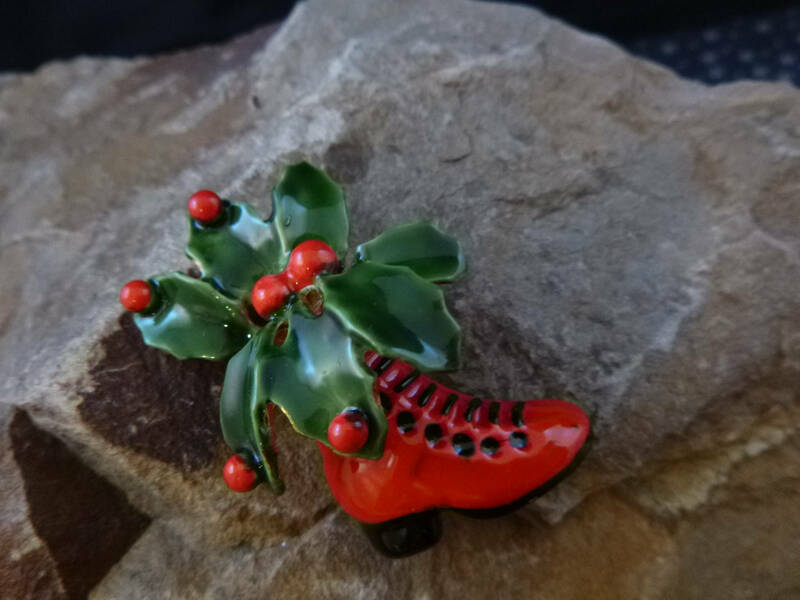 This Christmas pin beauty is in excellent vintage condition. There are no chips in the enamel, the colors are bright, the pin and clasp strong and secure, and the hallmark clear. However, even as a vintage piece in excellent condition it’s still not perfect. 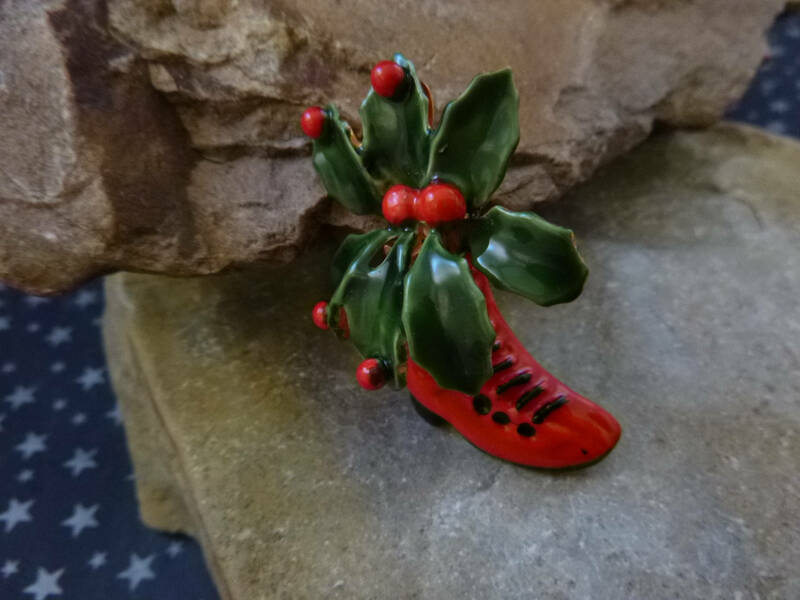 There is some slight bend to the back pin, a tiny black paint drip on front toe, and a little wear on the edges of the leaves. 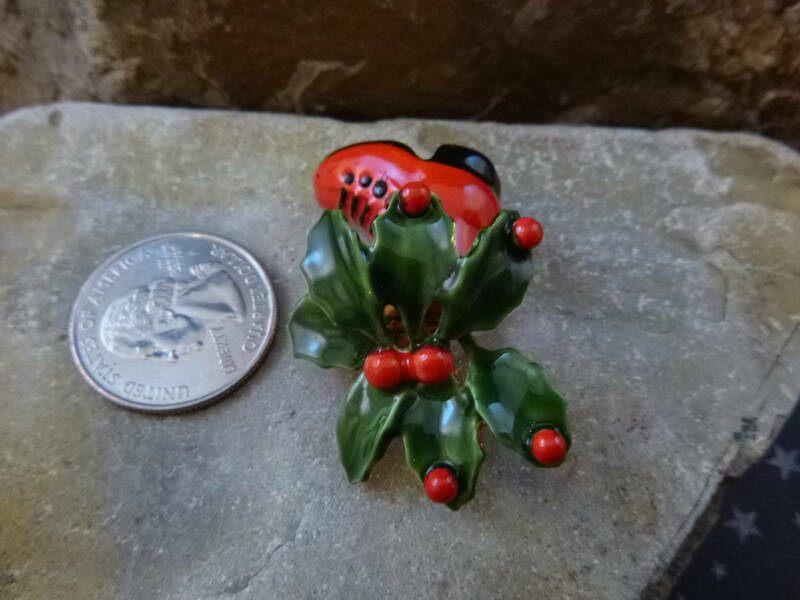 The pictures offer additional perspective on the condition and design of this wonderful vintage Christmas pin certain to brighten the holidays for any Christmas lover. (Note: On a few pictures there are a few white spots; these are light reflections, not any problem with the enamel or metal).